This last week, work and life have been quite complicated. So many work obligations, children’s extra curricular activities. Life has been busy, to say the least. My husband, who was hesitant about joining a CSA at first, a few years ago became a staunch supporter in the last couple of years. Last week, my fridge was overflowing with produce. I couldn’t keep up. Then, he uttered the dreadful words, “Hey, let’s cancel our CSA for next year.” That tore me up. It made me feel like I wasn’t holding my end of the bargain, using up all the vegetables and making the most of all the bounty we received every week. I had to think fast. SO, this past week, I became even more creative with new recipes for the numerous vegetables I had on hand. There are many options- you could split a share where you share every week or pick up alternative weeks with your partner. I am determined to be quite resourceful with my entire share. Every tomato that I can’t use I freeze, I make many greens into my APP. I give away some to friends and family and then some gets composted. This week, I made eggplant 3 ways. Eggplant and mushroom thoren( South Indian dish with grated coconut and mustard seeds and garlic). Panko breaded eggplant, and eggplant& lamb ratatouille. I will share recipes soon. I made a Thai red curry with chicken last night. It’s pretty easy and a great way to use many greens and things in your pantry. The best part of cooking is trying new things, putting flavors together that work for you and your family. Play in the kitchen. I use ingredients that I have on hand, if it calls for spinach, and I have kale, that’s what I’ll do. SO I SAY, CSA all the way! 1. Take a large sauté pan and heat coconut oil in pan. 2. Sauté chopped leek/onion, garlic. When slightly translucent, add galangal. 4. Add red curry paste. Stir. 5. Add kale, green peppers and shishito peppers. Typically, 1 in 10 shishito peppers can be hot, otherwise they are as mild as green peppers. 6. Sauté further for 2 minutes. Add coconut milk. 7. Cover and let cook for 10 minutes. 8. Add fish sauce and sesame oil and stir. 9. Garnish with cilantro. Serve over jasmine rice or quinoa. It’s a warm summer day, and my nephew has come over to hang out. He is definitely a picky eater. Doesn’t eat alot and is distracted by childhood play. He loved sushi when he was young. He would always talk about pumpkin sushi. I never tried it but he would rave about it, even at the young age of 3. But despite all this talking about food, he never really ate much or enjoyed eating. Now, he is definitely growing a more refined sophisticated palate but talks about food in a way that makes me think he would try something new and different. So our task for today is to make a healthy, quick, tasty dish that can satisfy my nephew’s palate and also ours. At home, we prepare meals based on what we have available. We definitely buy items based on what we want to cook. But if I want to make a pasta dish that includes maybe spinach and parmesan but I only have kale, I’ll substitute. Say I have no parmesan cheese at home but I have Asiago, then that’ll do. Waste not want not. Ingredients do make the dish and any herbs and spices you add can transform a dish to your liking. So, using what we had from our weekly Hilltop Hanover Farm share and items in our fridge and pantry… Green garden pesto emerged. We were running low on time and within 20 minutes, lunch was on the table. And by the looks of the bowls, we all LOVED it. Easy, simple,resourceful, yummy! Box of whole wheat penne pasta(or any shape you like). One large garlic scape and one long shallot flower including green stem(sub with two cloves garlic and one shallot). 1 lb of boneless chicken thighs chopped into 1 inch pieces. Boil pasta according to box directions. Chop sun dried tomatoes into thin strips. Finely chop garlic scapes and shallot flowers. Roll the leaves together and finely chop the leaves to get a ribbon like appearance. On a separate cutting board ( you may use the same one if you are done with all the vegetable prepping). cut chicken into 1 inch pieces. Pour 2-3 tbsp of oil in to pan. Place pan on medium heat on stove. Add shallot flowers and garlic scape to pan and stir to saute. Add a few pinches of salt. After this is softened, add the chicken to pan. Saute chicken until is white on the outside and it is more seared . Note: If the pan is not hot enough, the chicken will boil/steam rather than sear. this should take 5-7 minutes to cook completely. Add chopped kale, stir for 30 seconds. Add fresh oregano( optional). You may chop the leaves or just pull some off from stem and throw into dish. Add 3/4 cup of Asiago cheese. Salt and pepper to taste. Add milk( If you add cream, you get a thicker sauce). I had milk and so used that. Add pasta. Stir completely. Close with lid, place on low-medium heat for another 10 minutes. When done. stir one last time. Serve pasta dish in bowl and sprinkle some Asiago cheese on top. Enjoy! Living in a home where everyone in the household needs or wants to eat something different on a daily basis can be a daunting task. Making sure all meals are healthy(-ish) is just as difficult. Using all the greens that come in your weekly share is tricky… now, really, how many greens can you eat in a day and how many ways can you prepare them? So, this week’s CSA share included red mustard greens, mizuna, garlic scape and shallot flowers etc. Mizuna is an Asian mustard green that can be used in stir fry or eaten raw in salad. Mizuna is almost always found in the swap box. People don’t like it or just don’t know to use it. I have learned to appreciate the art of pesto making through my weekly share of the many bitter greens. Pesto can come in many forms, but it’s usually basil pulsed in a food processor with garlic, nuts, EVOO and Parmesan cheese. I make pesto with whatever greens I have at home and use it in pastas, rice, ground turkey and now….chicken curry. I usually don’t add nuts or cheese because that can’t cause it go rancid quicker. If I want cheese or nuts in pesto, I can always add later. You can make YOUR own rules around food, it’s what works for you and your family. Cooking should not be a task that becomes burdensome. If you have it at home, you can make into something delicious. 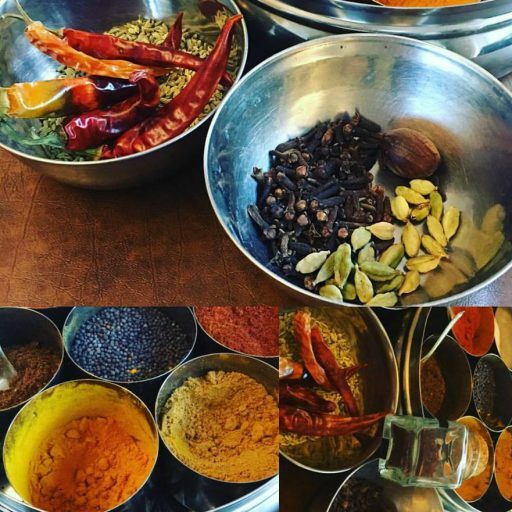 All you need is a stocked spice box. The right spices can transform any dish. Chop off the ends of the mizuna bunch, maybe 1-2 inches from root end. Wash mizuna, red mustard greens( 5-6 pieces) , and garlic scape(2-3) . Vegetables from local organic CSA shares are the healthiest and tastiest but can also be dirtiest. Welcome to the CSA life.. lots of dirt! Pulse in the processor ensuring it has a pesto consistency, drizzling in olive oil as needed( approx. 3/4 cup). This will yield you maybe a 1.5 cups of pesto. You could add mint or cilantro to this making it even more aromatic and flavorful. I use it if i have it.